Tomorrow, Friday 1st July, marks the centenary of the first day of the Battle of the Somme; a battle of World War 1 which killed more than a million soldiers collectively. On the first day alone, 19,240 British soldiers were killed, with 38,230 reported injured or missing; some within minutes of starting their military career. A day that is being remembered for obvious reasons tomorrow. Before the first advance, 1,738,000 shells were fired, by the British, in the hope of destroying the German defenses. However, these shells did not do any major damage to the German trench system; even leaving barbed wire intact. 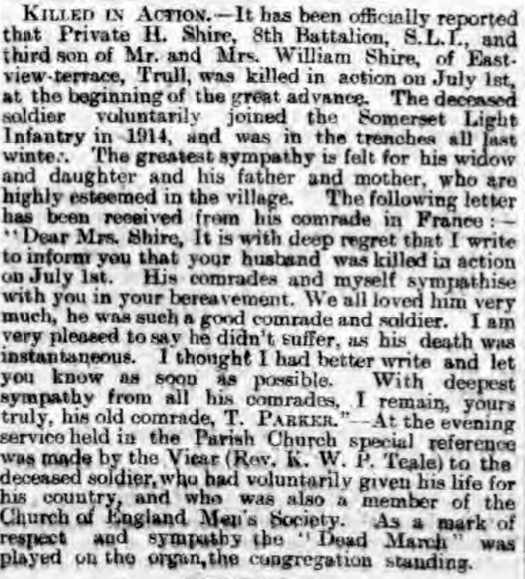 One of the 19,240 British soldiers killed was Herbert Shire; although not an ancestor of mine he is one of the soldiers that I had come across while researching the Shire family as a project. Private Herbert Shire of the, 8th Battalion, Somerset Light Infantry was born in 1880 to William and Emma Shire, the fifth child of their marriage. He enlisted in November 1914 and was sent to France the following year. Herbert would have fought in many battles, but the Somme, was, sadly, like no other. Herbert was killed instantly and his comrades wrote his wife, Minnie, to tell her of his death. Herbert is remembered on the Thiepval Memorial, where a commemoration is being held tomorrow and is being shown on BBC One from 9:15 to 12:15 tomorrow morning. Sadly, Herbert wasn't the only Shire to have been killed in the Somme, Herbert's first cousin, Sidney Shire died on the 20 August 1916, most likely from infection of wounds he sustained in Battle. Sidney was only 24 years old and was buried in Blighty Valley Cemetery in Authuille Wood.